A standard size stick suitable for a wide variety of sizes, players and positions, the Katana is a great mix of light, fast and still has a booming pass. Hydro UWH's fiberglass reinforced polyurethane sticks allow for innovative, strong designs. 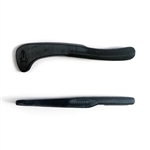 Textured handles with ridges for finger grips in different hand sizes and a thumb grip texture. Tapered blade gives a solid sweetspot for big hits and slim profile for fast handspeed and quick skills. A shorter stick at 260mm long, the Katana 260 has all the features of the standard sized stick with a slightly shorter handle and shorter blade. A stick especially for forwards or players who prefer smaller sticks. The slim tapered design allows super-fast handspeed through the water while keeping a bit of weight near the handle for that satisfying crunching tackle. Back by popular demand, this is an updated version of the original NZ plastic forwards stick first produced briefly in 2008 and constantly requested ever since. Great front pass and monstrous backflick, fully textured for the best grip on the puck possible and fantastic handling. The Rocket is compact, has weight near the thumb for big hits and a large taper to keep up speed. The hook is short but very strong, following the radius of the puck to lock it in when tackling and turning and greatly assisting puck control and possession skills. Inspired by a 90's design created by Dolan "Pocket Rocket" McGinley.